We’re excited to announce that iClassPro supports partial refunds. After a payment has been taken and processed, iClassPro users can refund customers the full payment amount or any fraction of the payment. Payments taken in the form of cash or credit card (though iClasspro, Money Movers of America (Process Pink), SafeSave Payments, Authorize.net, or Bambora/Beanstream gateways) can be issued partial refunds. 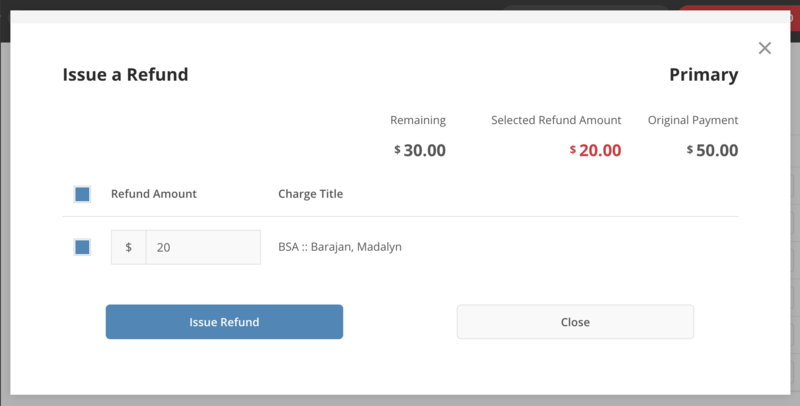 Select the "Ledger Info" icon and then expand the "Full Ledger"
Locate the payment you would like to issue a partial refund for and select the "Refund" icon and click "Refund"
Simply enter the amount that you would like to refund and click"Issue Refund"
It is important to note that while all payments qualify for full refunds, payments made before June 15, 2018 combined with a credit will not qualify for a partial refund. If a credit card payment has been taken through one of the approved gateways, it must be settled before a partial refund can be made. Learn more about partial refunds on our Knowledgebase here.